The provinces of Canada are unified in their approach to motorcycle helmets, making this so easy to understand for riders. The motorcycle laws are consistent across all 10 provinces and 3 territories. The rule is clear: all riders on a motorcycle must wear a crash helmet at all times. It doesn’t make a difference when it comes to factors such as age, speed, passengers, or anything like that. All passengers must wear a helmet at all times. This differs from the United States, where laws can get really complicated depending on age, experience, and other factors. The laws also vary from state to state. Your helmet must also meet Canada’s helmet health and safety standards for you to wear it legally. Make sure you know the motorcycle laws of anywhere you choose to ride to be on the safe side. It’s a good idea to wear a safe helmet at all times regardless of the laws, though! A modular helmet turns a full face functioning helmet into an open face helmet by flipping up the chin bar. 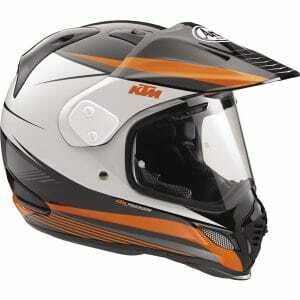 This type of helmet is popular with adventure and sport touring riders. It’s particularly good for those who may want to grab a snack, call a friend or stop for a cigarette on their travels. It is not recommended to ride in the open face position, as it can be dangerous. 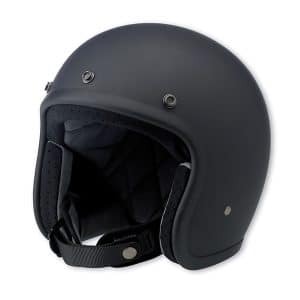 The half helmet is popular with cruiser and vintage riders but they offer minimal coverage. They lack in safety features but they are DOT approved which makes them legal on Canadian roads. These are similar to regular full faces but with sun peaks and pronounced angular chin bars. When it comes to coverage, people say dress for the crash not the ride. Coverage is crucial, and you don’t want to take any chances. A full coverage helmet is the safest you can buy. You want to make sure your helmet has passed safety standards and is legal to use wherever you are. Make sure you double check this before you buy a helmet! Always look for an ideal fit for you. It’ll be totally different to the ideal fit for somebody else. If you can try a helmet on before you buy, that’s great. Make sure it isn’t loose as it needs to stay snug on your head. However, it should not be too tight as your head can begin to hurt. Loose helmets will come off during a crash so bear that in mind. Loose helmets can also increase wind resistance which can cause neck ache. Be smart and make sure yours is a snug fit. You must always keep comfort in mind regardless of the type of helmet you think you’re going to go for. This is something that may be worn for long periods of time, so ensure it is as comfortable as it can be while fitting snuggly. It shouldn’t cause any more pressure on your head than it needs to, so you don’t get a headache or neck strain. We’ve mentioned aerodynamics before in the post, but it’s another crucial thing for you to consider. It impacts the comfort and safety of a helmet, and can help in avoiding injury. Air is pushing towards you as you ride, so your neck muscles will work against the force to keep your head up. This can cause strain if resistance is too excessive, and any protruding features can catch the wind making it worse. Riding on the freeway often should mean that this is a huge concern of yours. Cutting wind resistance is crucial. Your neck muscles can be overtaxed when wearing a heavy helmet. This means you can get headache, neckache, backaches, and even cause other injuries. The lighter the helmet, the less strain you’ll experience. Things like latches, visors, and hinges can add weight to a helmet, so bear that in mind. You must be able to see obstacles and any dangers well. The size of your eye ports are important. Larger ports mean better viewing as you ride, however, they also make the surface area of the head parts that are protected smaller. May also leave more room for flying debris to hit the face. A visor can help to stop this but doesn’t offer much in terms of protection. Also, if you need to wear prescription eyeglasses you must check that the helmet is built for that as some can make it difficult. 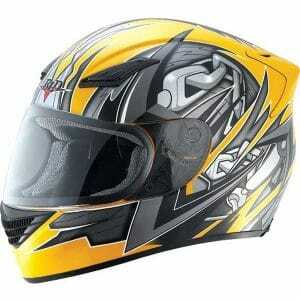 There are an abundance of features you can choose with your helmet. Reflective material can increase visibility to other road users, which is helpful if you ride at night. Reflective shields look cool and can keep the sun at bay. There’s even an eject helmet removal system to easily get a helmet off the head in case of an accident. This is where air is pumped into a small airbag so the helmet pops off the head. It can stop an injury from worsening. There’s also communication gear, helmet cameras, breath deflectors, shock absorption, anti fog shields, decals and designs, and more. 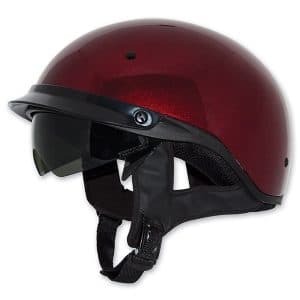 The terrain you ride on most often will impact the type of helmet you choose, for instance, you may choose a motocross helmet for off road riding. Commuting means needing features to keep you safe alongside cars each day, so consider this carefully. Helmets will vary in price depending on the type, features, brand, and more. There are many factors that go into the price of a helmet. 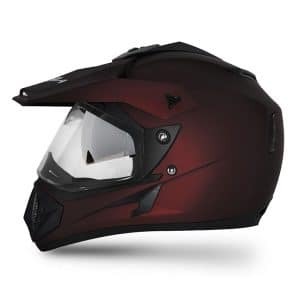 It’s important you don’t overspend on your budget, but equally as important that you’re willing to buy a decent helmet and not just go for the cheapest one you can find. It’s always worth spending a little more if it’s going to keep you safer in the long run. You want to make sure that whatever helmet you buy, it stands the test of time. This is why a good warranty can be important. The warranty will vary from brand to brand, and will be different based on product type too. If you’re unsure of the warranty offered to you, or even if there is one, you can contact the manufacturer to double check. Safety and comfort should come first in a helmet, but considering the appearance will ensure you stay stylish and you’re happy with how you look as you ride. The color, pattern, stickers, and similar aspects can all make a difference to how your helmet looks. You can even buy appearance enhancing things to add yourself once you’ve bought your helmet, but you’ll need to ensure that they don’t impact the way you ride. Finally, you may want to consider the type of bike you ride when selecting your helmet. If you ride a traditional, vintage style motorcycle, you’ll likely want a vintage style helmet that matches that sort of era and look. If you’re riding a contemporary bike, then something more modern looking will likely work better for you. 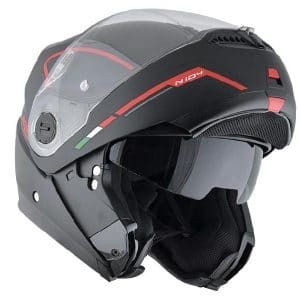 This will give you a more uniformed look as a rider, but remember that the safety and comfort aspects of a helmet are far more important than the way you look! Choosing between the different kinds of motorbike helmets can be confusing, which is why we decided to create this comprehensive guide. You want to stay safe, comfortable, and stylish too. When you know what specific type of helmet you need, it’s simply a case of deciding on any extra features, the colors, and specific design. You can feel secure, safe, and happy with the right helmet. Hopefully this definitive guide has helped you to figure out what you need!